An artist's illustration showing NASA's OSIRIS-REx spacecraft preparing to sample the asteroid Bennu. OSIRIS-REx began its final approach toward Bennu on Aug. 17, 2018, and is scheduled to arrive in orbit around the space rock in early December. A NASA asteroid-sampling probe has entered the homestretch of its deep-space journey. The OSIRIS-REx spacecraft began its final approach toward the big near-Earth asteroid Bennu on Friday (Aug. 17), NASA officials said. The milestone also marks the official start of OSIRIS-REx's "asteroid operations" mission phase, they added. But don't get too impatient: OSIRIS-REx is still about 1.2 million miles (2 million kilometers) from Bennu and won't arrive at the 1,650-foot-wide (500 meters) space rock until Dec. 3. The $800 million OSIRIS-REx mission — whose name is short for Origins, Spectral Interpretation, Resource Identification, Security, Regolith Explorer — launched on Sept. 8, 2016, from Cape Canaveral Air Force Station in Florida. If all goes according to plan, the probe will study Bennu from orbit for more than two years, gathering a variety of data. OSIRIS-REx will also spiral down to snag a sizable sample of asteroid material before leaving Bennu in March 2021. This cosmic dirt and gravel will come down to Earth in a special return capsule in September 2023. Scientists around the world will then study the sample, looking for clues about the solar system's early history and evolution. Carbon-rich asteroids such as Bennu are thought to have delivered huge quantities of life's building blocks — complex organic compounds like amino acids — to Earth long ago, along with lots and lots of water. So the Bennu sample could also shed light on the early history of life on our planet, mission team members have said. In addition, Bennu is a potentially dangerous asteroid that might line up Earth in its crosshairs one day. 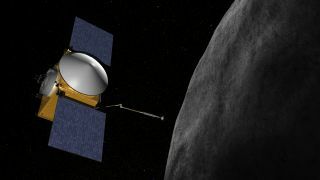 The data OSIRIS-REx gathers from orbit, as well as details of the space rock's composition and structure gleaned from analysis of the returned sample, could therefore help humanity better defend itself against asteroid threats, NASA officials have said. It's an exciting time to study asteroids. In June, Japan's Hayabusa2 spacecraft arrived in orbit around the near-Earth asteroid Ryugu. Hayabusa2 will also grab samples, which are scheduled to come down to Earth in late 2020.